What better time than the advent of the New Year to get outside and challenge yourself, your friends and even your family to do something different and enjoy the great outdoors? The team at Coppermines have put together a list of our top challenge events for 2016… there are things to test and things to enjoy… after all it isn’t just about the pain… it’s about the taking part too! A 14 mile road race around Coniston Water and as such is one of the most picturesque courses in Britain. 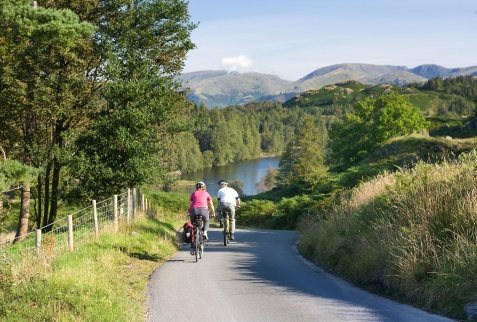 This hilly route follows the road that circles Coniston Water, with stunning views of the surrounding mountains from the lake shore route. Each year runners raise £20,000 each for local clubs, charities and good causes. The Grizedale Duathlon is a unique multisport event based in the stunning setting of Grizedale Forest, in the southern Lake District. With stunning views over the Coniston fells and an extensive network of forest tracks and purpose built bike trails, this is a spectacular location for trail running and mountain biking. The event is suitable for all abilities, whether you have never competed in this type of event before or looking for a tough challenge. Starting and finishing at Hawkshead, the 17km Hawkshead Trail Race, 17km Hawkshead Trail Challenge and 10km Hawkshead Trail Run, follow circuits along well marked and marshalled footpaths and bridleways, taking in panoramic views of Windermere and the surrounding peaks of the Coniston and Langdale Fells. All of the routes take in the infamous, mile long, near vertical, killer climb of the ‘Coffin Trail’! If you love to ride in wild, unspoilt mountain country. If you love a fantastic, rewarding, shared challenge If the food, the people and the experience are as important as the clock then Lo Scorpione is for you! With a total of 101km with + 2030mtrs of height gain this classic figure of eight circuit around the wild western fells with ten significant climbs and not much flat in between this should prove to be a bit of a challenge for 2016! There’s loads of climbing in the 10%+ band and more than enough at 20%+. You’ll be on some of the wildest roads in England with some staggering views and wonderful wild settings. At 300km The Mighty Corinthian is just like a one day classic from back in the day and the longest one day classic bike ride in the world! Big distances, lots of climbing, spectacular locations – all ridden on vintage steel bicycles in period kit! The Mighty Corinthian showcases the finest of the Lake District landscapes – coastal plains, wild moors, gently rolling fields, wonderful villages, the odd mountain pass and more than a few lakes! This isn’t about going fast; it’s about having a huge experience with like-minded people, it’s about having one of the greatest days of your life! The Lakeland 100 ‘Ultra Tour of the Lake District’ is the most spectacular long distance trail race which has ever taken place within the UK. The circular route encompasses the whole of the Lakeland Fells, with 6300m of ascent on almost entirely of public bridleways and footpaths. The route starts in Coniston and heads south before completing a clockwise loop which takes in the Dunnerdale fells, Eskdale, Wasdale and Buttermere before arriving in Keswick for the finish. If that sounds too much then there’s The Lakeland 50, taking place on 30 July, which runs over the second half of the Lakeland 100 Ultra, completing the final 50 miles of the 100 course. Long distance open water swimming isn’t just about swimming around buoys in a loop – it’s about the journey. Travelling the length of a lake from one end to the other, swimming across a channel, or completing a swim from one set point to another gives the swim meaning. You haven’t swum a lake until you have completed the full length of it! Chillswim Coniston is a mass participation, fully supported swim the full 5.25 mile length of Coniston Water, in the Lake District. This women only sportive now in its third year is a real hoot and is described as the finest of its kind in the north! There are two routes, both of which follow the shores of Coniston Water: one of England’s finest lakes. They are both lovely routes, with the shorter route designed to present an achievable challenge to first timers. So join us and experience this landscape for yourself – ride any bike you like, wear any outfit you like, the only rule is that you have a great day! Starting and finishing at Landing Point, Coniston Hall near Coniston village, the 10km Coniston Trail Run, 15km Coniston Trail Race and 15km Coniston Trail Challenge take in panoramic views of Coniston Water and the surrounding peaks of the Old Man, Swirl How, Wetherlam and Dow Crags. There is one short 200m section killer section, which only agile mountain goats will be able to run so be warned! To find out more about Coppermines and Lakes Cottages please visit: www.coppermines.co.uk or contact me directly for more information or images – Greg Stephenson /gstephenson@cumbriatourism.org / 01539 825019.